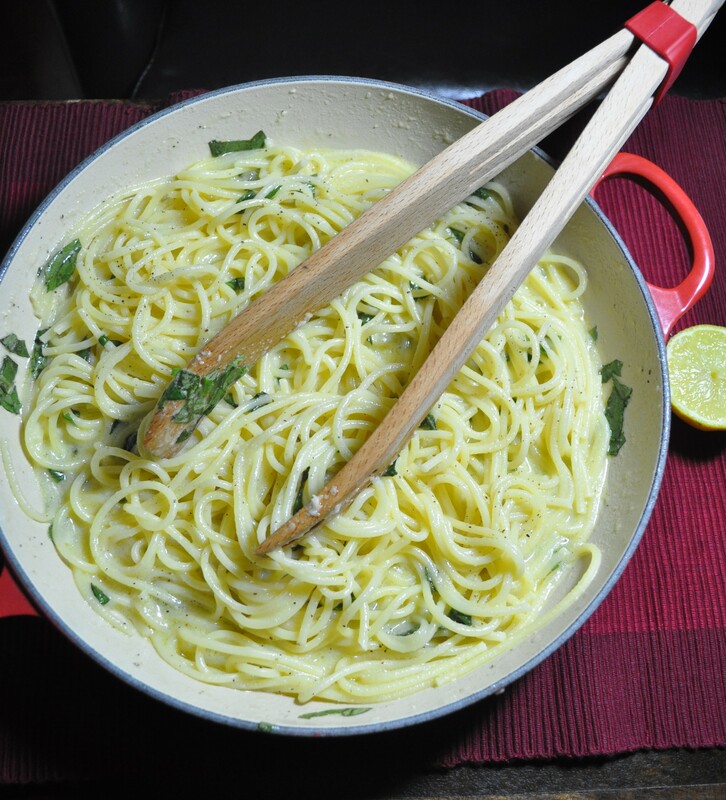 … or to give it it’s proper title, Spaghetti al Limone. This is my contribution to International Day of Happiness! Not really, it’s just a coincidence that I’m posting this today. However, it is a little bit of sunshine on a plate. I have adapted this from The River Café Cookbook by Rose Gray and Ruth Rogers, a great book for Italian recipes. 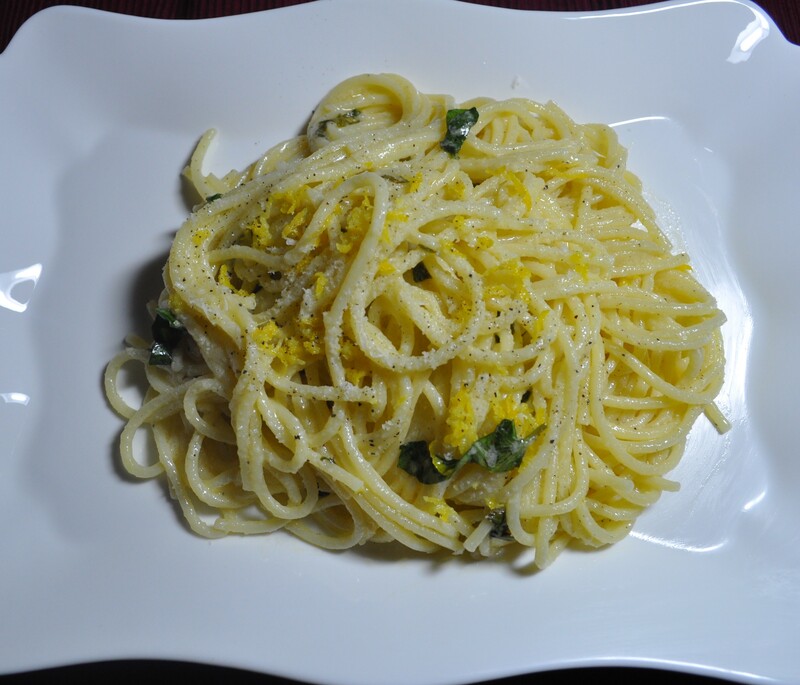 It is so simple and it will be on your table in under 20 minutes. There are many variations and ways that you can adapt this to your tastes. Nigella uses thinly sliced mushrooms in her version; others use chilli flakes, garlic, cream or cream fraiche. And of course, I’d never refuse a bit of bacon! But I have to say I like this as it is, very light and zesty. I have changed the amount of pasta and played around with the amounts of the other ingredients. The original recipe calls for nearly double the lemon juice. The amount below is enough for me. Feel free to add what works for you. Freshly ground black pepper and salt to season. Cook your spaghetti as per packet instructions. Zest the lemons before you juice them. Meanwhile beat 3/4 of the lemon juice and the olive oil together and then stir in the grated parmesan until thick and creamy, the parmesan will melt in. Taste and season with pepper and salt if needed. I use quite a lot of pepper but did not use any salt as the parmesan is salty and keep in mind that the pasta is also cooked in salt water. Add the rest of the lemon juice if you like. Drain the pasta lightly. Allow some of the cooking water to cling to the strands of spaghetti as this will allow the sauce to coat the pasta better. Return the spaghetti to the pan and pour over the sauce. Toss lightly so that everything is well mixed. Add the basil and mix again. Serve immediately and sprinkle the zest on top if using. Then grate more parmesan and black pepper on top to taste. You could serve with a simple rocket and tomato salad on the side. I love the combination of ingredients! Sounds so good! I recently made a cold lemon pasta salad and wondered if it would be good warm as well. I must try this and see! Thank you for the idea! That’s funny because I was thinking it would probably make a great salad 🙂 I hope you like it!